Gong Ming figures things out, but Xiang Xiang is still not getting it. Also, first signs of budding love. While everyone at the press conference is freaking out about Xiang Xiang, she is in the loving embrace of Gong Ming. They recognize each other and Gong Ming continues to call her 女儿 which means daughter in the modern times, but used to mean woman in general. Anyway, he asks her where he is which totally confuses her. 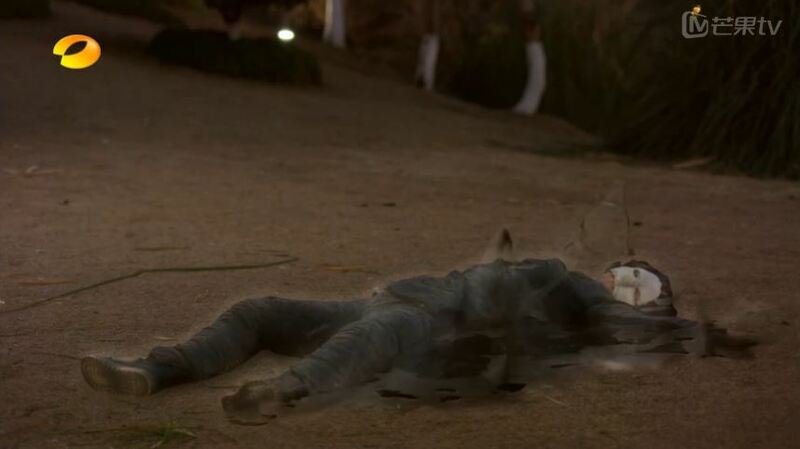 They look over and see the masked man disappear into smoke. Next time Xiang Xiang wakes up she is in the hospital. Her two besties are beside her as she tries to explain what she saw. Xiang Xiang inquires after Gong Ming, but they think she has gone off the deep end. After Xiang Xiang has some snacks, Jing Jie starts to lecture her on running away at the press conference and fainting outside. Then, Jing Jie collects all of the snacks and dashes out the door. LOL. Yes take the girl’s snacks. Xiang Xiang looks through her stuff, but instead of finding her cell phone, she finds Gong Ming’s pendant. So guess who has the phone? Apparently a staff collected Xiang Xiang’s stuff and grabbed the pendant, leaving her phone behind. Gong Ming couldn’t find his pendant, so he took her phone. He has NO idea what it is and he has no idea how to pick up so he just let’s it ring. what is this mysterious item? quick, someone explain to gong ming! Now, let us not forget about Wang Mang. Three mysterious masked elders order him to kill off Gong Ming. They also reveal that they have planted Zhao Yan Fei by the Emperor and they are going to jump start the scheme by investigating Ying Yue. 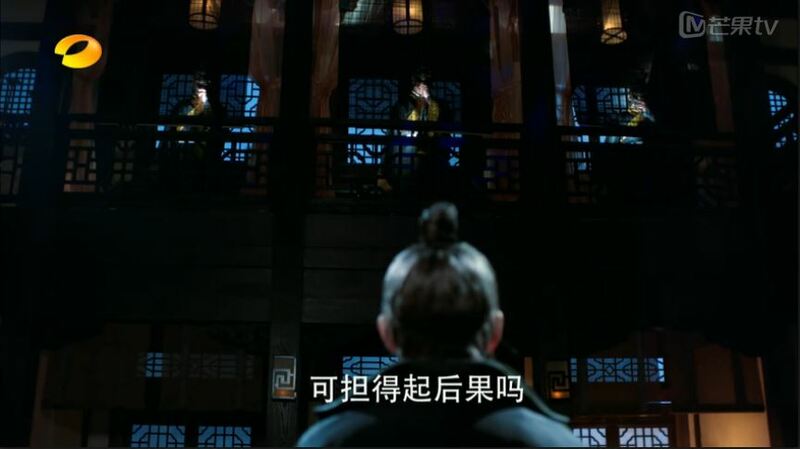 This angers Wang Mang and he swears that he will end the masked elders if they dare to touch Ying Yue. BTW there are only three elders but like five different voices, including one really fake falsetto. Are they trying to stop me from taking this seriously? Wang Mang rushes over to save Ying Yue from cruel fate as someone is about to burn her face. Wang Mang subjects the bad guy to the burning iron instead and quickly releases Ying Yue. 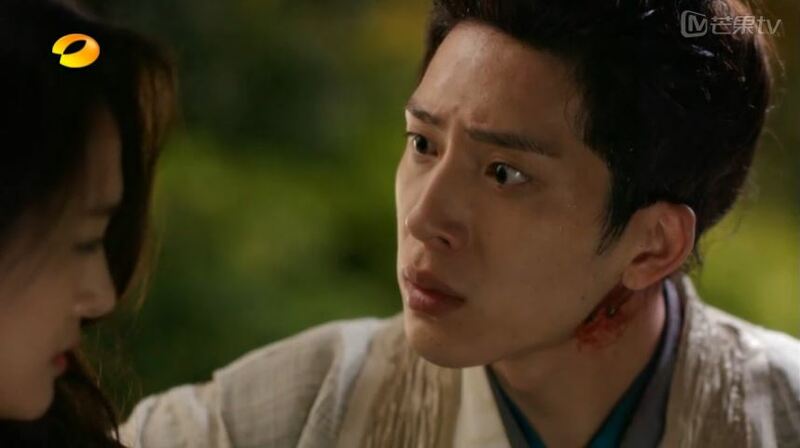 As if she is out to hurt him, her first words are to ask after the wellbeing of Gong Ming. Wang Mang questions why she is still thinking of Gong Ming when he clearly has no intentions of being with her. Yeah, why, Ying Yue, why? It ain’t ever gonna work, girlfriend. Where’s homeboy Gong Ming you ask? He is about to get hit by a truck. Luckily he learnt from his previous mistake and actually gets out of the way. I’m surprised the truck driver doesn’t throw swears his way at all. How civil. And so, onwards, Gong Ming! 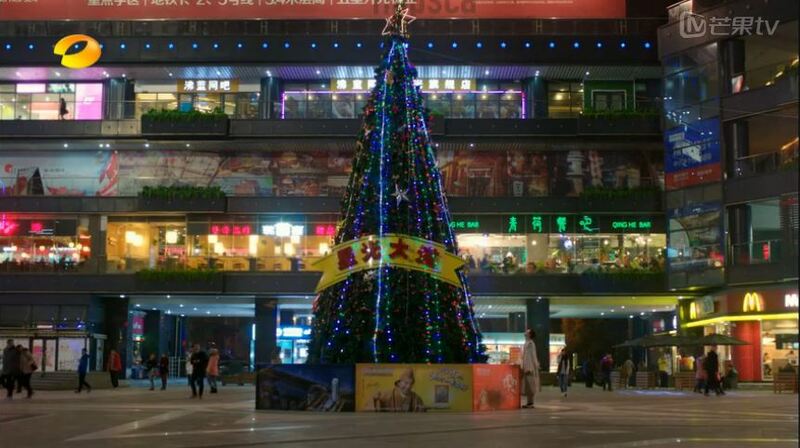 He spots a giant Christmas tree and is entranced by the blinking lights. Before he can examine the light bulbs any further he sees a girl (he thinks she is Xiang Xiang) being chased down the street by two policemen. He mistakes the police for bad guys and comes to the girl’s rescue, causing quite a bit of trouble. Finally, Xiang Xiang gets through on her phone after two high school girls pick up. She goes to Gong Ming’s location and the two have some accusative conversation about stealing each others’ stuff. Gong Ming is predictably serious again and says things like “I would never steal.” Just as Gong Ming demands his pendant back, two security guards catch them loitering and take them into custody. Xiang Xiang explains that Gong Ming thinks he is Cao Cao because he is psychologically unwell which explains the outfit. 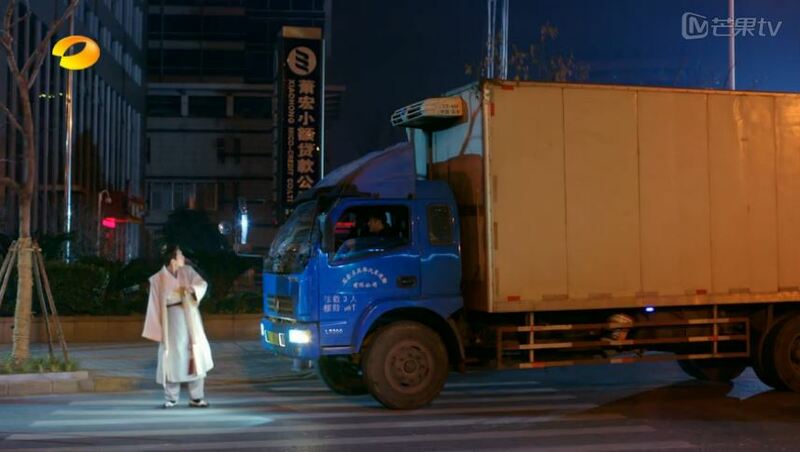 The security guard quickly assumes that the pair escaped from a mental institute together because Xiang Xiang is in a hospital gown so he goes to call the police. Uh-oh. Before the security guard comes back though, Xiang Xiang and Gong Ming successfully gets outta there and rides away in style. This of course, is too much for poor Gong Ming who is terrified that they are moving so quickly, but he is a MAN so he claims he just doesn’t understand the “metal beast” aka car. Gong Ming tries to convince Xiang Xiang that he is from the Han dynasty, but she doesn’t believe him because that would be like you know, two thousand years ago. This time difference totally shocks Gong Ming, and it doesn’t help that Xiang Xiang is a pretty bad driver. Just then, Xiang Xiang gets a call from Jing Jie informing her that Na Na is going to quit the show. Xiang Xiang seeks to appease the situation and Gong Ming comes along for the ride because he wants his pendant back desperately. They find the director and while chasing him down Gong Ming saves Xiang Xiang from getting run over by a car. Oh, this man learns fast! After convincing the director that she will patch things up with Na Na, Xiang Xiang takes Gong Ming out for McDonald’s. She notices the wound behind his ear and tries to put some ointment on it, but finds his hair in the way. So what do they do? They dump their uneaten fries (whyyyyy) and go get him a haircut. Gong Ming freaks out about his short hair though because “hair is a gift from parents, how could one easily rid of it?” Yes, yes, but you look good, promise! 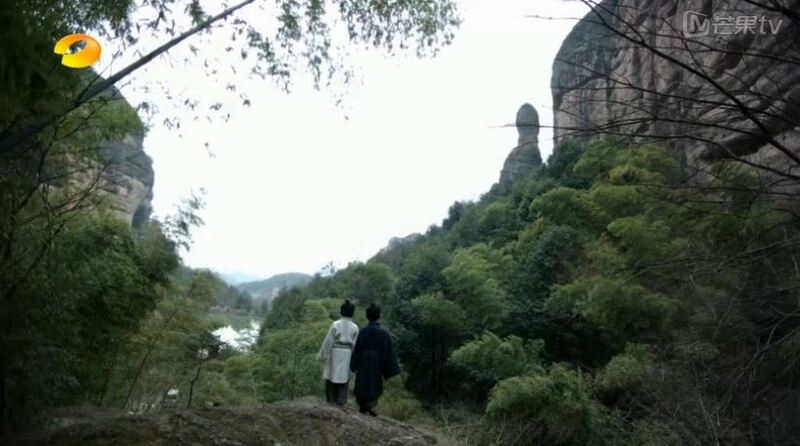 Back in the olden times, Wang Mang is nostalgic for his childhood days with Gong Ming. 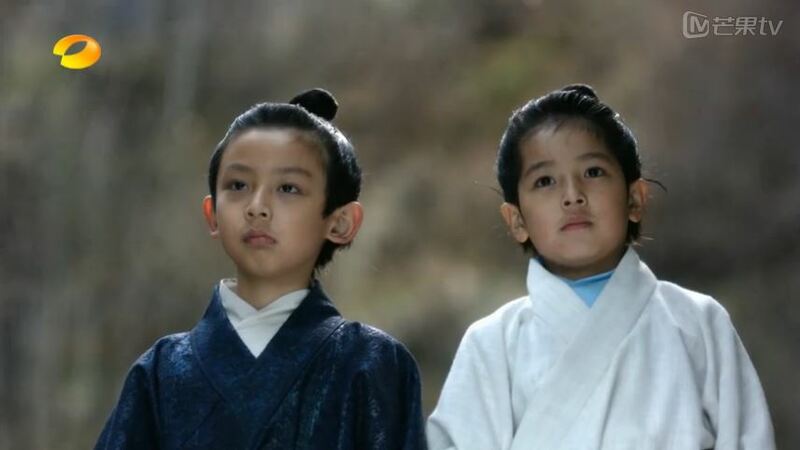 There was one time when Wang Mang was falsely accused of stealing their teacher’s book by the other classmates. 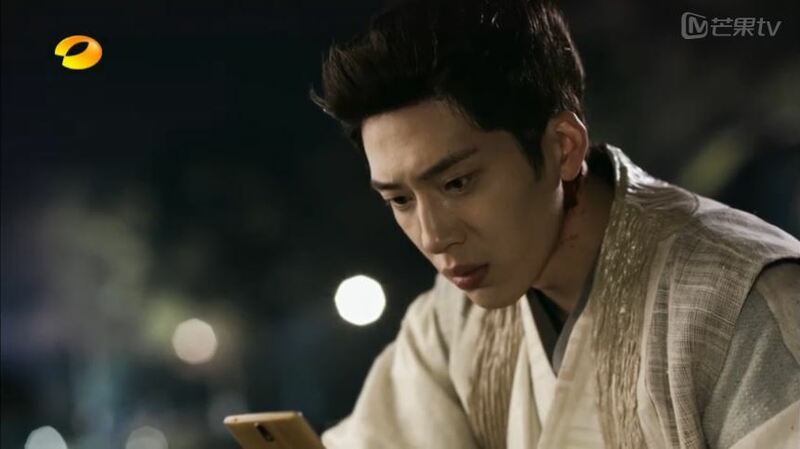 Gong Ming found the book and revealed the truth, saving Wang Mang from receiving further punishment. The two became good friends, and made a promise to study well in order to bring peace to the nation. Wow, admirable kids! these are not the same kid as before, right? In 2015 again… Xiang Xiang visits Na Na at the salon to apologize for going MIA day of the press conference. Na Na demands that Xiang Xiang kneel down to beg for forgiveness. Xiang Xiang refuses and a slap fest ensues. 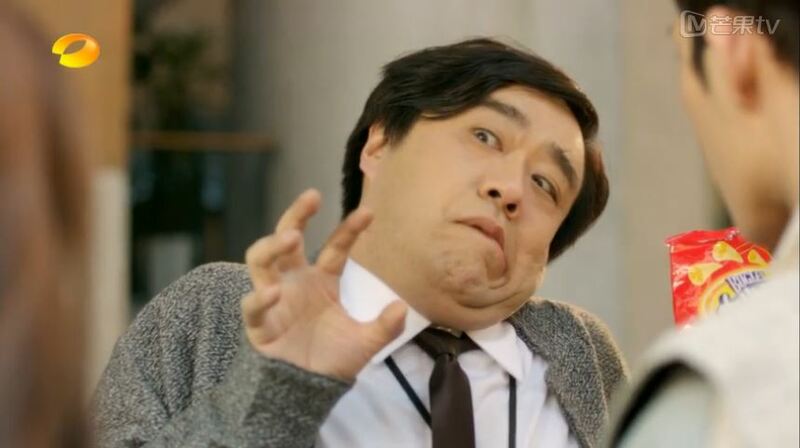 After struggling to take off his seatbelt (he just puts it over his head instead of unbuckling) and open the car door (he rams into it a couple of times), Gong Ming enters the salon (he is amused by the automatic door) to stop Na Na from hitting Xiang Xiang a second time. He grabs Xiang Xiang’s hand and leads her out the door like a boss. Go, Gong Ming! P.S. this is how you can tell it’s based on a kdrama – with all the hand grab and all. Finally, Xiang Xiang sorts out her feelings and off they go to get his pendant. She asks him about the importance of the pendant, but he doesn’t answer. After retrieving his pendant, Gong Ming readies to leave and Xiang Xiang stops him, offering to give him a ride to the train station. She reaches out her window to clear away some fog and just then he disappears which scares the crap out of her. Haven’t had enough? Click for episode 4 recap! Yu Fei confronts Na Na in the elevator and they start a small fight, causing the director to almost faint. Poor guy! Gong Ming uses 点穴 or dian xue to stop the director. Dian xue is an old martial arts move that can make someone immovable. 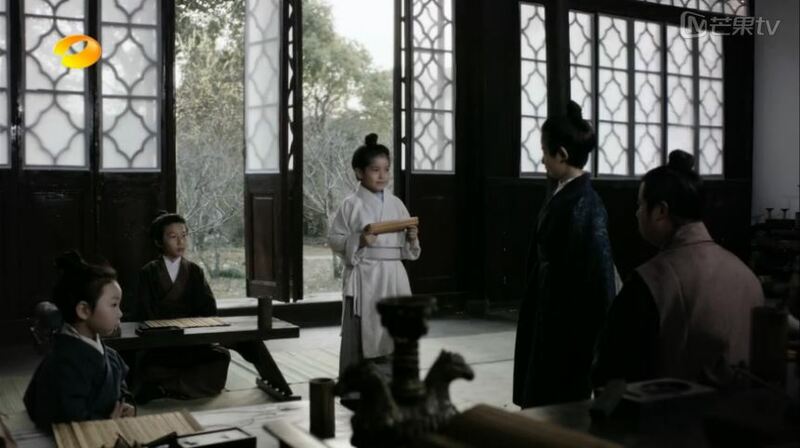 Xiang Xiang lies to the director and tells him that Gong Ming is her distant cousin who practices martial arts and is psychologically unwell. Girl, you keep thinking that. Gong Ming comments on how…erm, weighty girls are in modern times. While Xiang Xiang is gone, a police cruiser drives by and Gong Ming ducks his head. You got something to hide, mister? Good news! Gong Ming learnt to say miss instead of daughter. Thanks for recap. Im addicted with this drama. Keep fighting for recap. You’re welcome! 🙂 They probably picked Bo Ran in part due to being similar to Boong Do. Right? Where can I pick one up? Although there was a media wave phenomena like two years ago in China when someone took a picture of a good looking hobo and posted it online. He actually was homeless because he forgot who he was, but because his picture went viral his family were able to find him and take him home. It was sweet. BTW, I went to the spam box again today to retrieve your comment. WHY doesn’t it learn??? Estelle I just love your recaps. I have this dumb smile on my face while reading them.